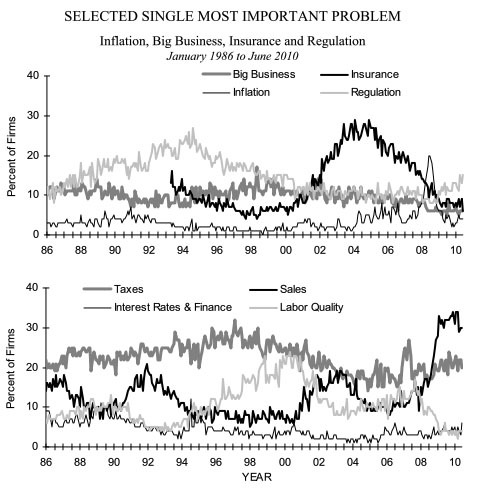 Via Ezra Klein here’s a survey of small businesses that’s been conducted by the National Federation of Independent Businesses for the past few decades. The question is: What’s your single most important problem? (It’s broken up into two charts so you can see all the trends clearly.) In the early 90s it’s taxes. In the mid-90s it’s regulation. In the aughts it’s insurance. And today? It’s poor sales. It’s true that fear of the regulatory environment has gone up slightly over the past year, but the problem driving lack of hiring and investment is still crystal clear: lack of demand. If people were buying more stuff, businesses would be expanding. This is just one data point, but it’s a telling one. Even with the massive propaganda campaign that’s been underway ever since Obama took office, small businesses still mostly don’t seem very concerned about the changing regulatory environment. Mainly they’re concerned about the economy sucking. If we want them to start expanding and hiring, that’s what needs to be tackled.